Behind Her Back is the second in the StoryWorld series by Jane Lythell. I haven’t read the first one (Woman of the Hour) but this can easily be read as a standalone novel. Liz Lyon is a producer on popular morning tv programme Storyworld and has just returned from her holidays to find that changes are afoot for the programme and its staff, changes which look as though they will make her working life rather difficult. In particular, a new member of staff, Lori Kerwell, seems to be working to undermine Liz and Liz is beginning to wonder just how much is going on behind her back. Although the tv world is not one that many of us will be familiar with, Jane Lythell shows that issues faced in that environment aren’t much different from the more typical working world. Liz has to face a dilemma which will be familiar to many working mums, in particular single mums, how best to balance work and outside life. Just like many workplaces, office politics are all too evidently in play with suspicion and gossip but also camaraderie and support. Challenges facing women such as changes to working conditions when returning from maternity leave and pressures of working in a high profile, high pressure job are all too clear in the story concerning presenter Fizzy. I have to say I didn’t envy Liz as she was dealing with tabloid stories, the office rivalries, a possible new romantic interest in her life, dodgy builders as well as a teenage daughter and all the dramas surrounding her. Throughout the book though, Liz’s integrity came across clearly. The mention of major news stories from recent months gave the story a very contemporary feel. I liked the way the story had quite an open ending, allowing the reader to make up their own minds about how certain storylines might resolve. This also left some avenues open to be continued in future StoryWorld novels and I’m certainly looking forward to seeing what happens next for Liz and the team. 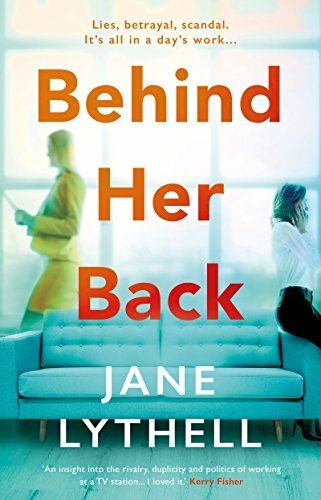 Behind Her Back is an easy to read, enjoyable book and one of its strengths for me was Liz as a strong female lead character. Even though she has a high-flying job, she’s a character I think that many women will be able to identify with. It gives an interesting insight into the world of daytime live tv broadcasting, with the author’s own experiences used to great effect. It’s a book which shows many of the challenges working women face and will have you firmly on the side of the main character. What a thoughtful review Joanne. You have highlighted the issues about women’s lives now which I wanted to communicate.